What can I send to Denmark? What items are restricted? Duffles, holdalls, rucksacks and similar bags cannot currently be sent on the Express service, at present only suitcases and boxes can travel Express. If a Standard service is available duffle bags, holdalls and rucksacks can be sent on the Standard service. Shipments bound for international destinations from the states of Idaho, Montana & Wyoming may require drop off to a third party agent and take an additional 2 working days in transit on top of the quoted transit time. Please contact us for further information. 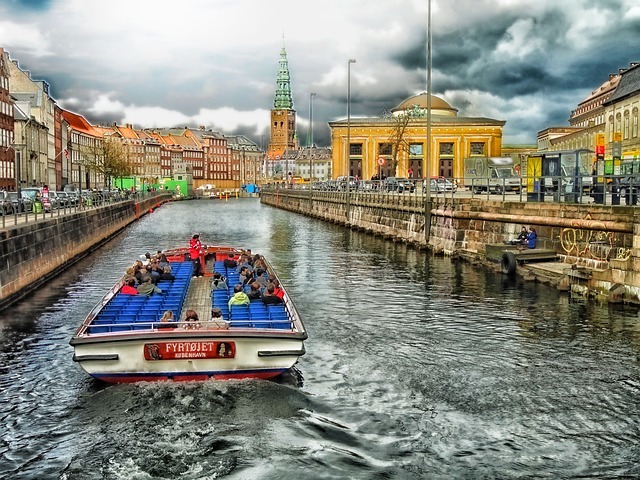 Denmark is a great destination for those who like outdoor activities, whether it’s hiking, boating or fishing, and many travelers prefer to take their own equipment with them. Send My Bag can help you transport your excess baggage and sports equipment from your home to anywhere in Denmark quickly and securely. We have fantastic rates and you won’t have the hassle of checking in your luggage or waiting for it at the luggage carousel. Our service is great for tourists that want to travel light but still have access to all their items when they reach their destination. Our carrier service is also a great choice for students relocating to and from Denmark. Students can pack the items they need ‒ books, clothes, DVDs, etc. ‒ into a box or suitcase and have it arrive at their student accommodation. If you are going on an activity vacation to Denmark, or if you are moving there permanently, you can send your things to Denmark with Send My Bag. This way, you will be able to bring many more items than you could if just checking in a couple of bags into an airplane’s hold. You can also avoid having to wait around at bag drop or luggage carousels and get on with enjoying the journey. Send My Bag has many international routes, with affordable rates for each route up to a massive 66 lbs. To find out more about sending luggage to Denmark, visit our ‘How it works’ page, or our ‘FAQs’. There are around 150 golf courses to choose from in Denmark, of which Scandinavian, Lübker and Esbjerg are among the best. If you want to take in a few rounds of golf on your trip to Denmark, you can do so with your own clubs, by shipping them to Denmark with Send My Bag. You won’t have to drag your clubs behind you and you will also avoid any oversized baggage fees from your airline. So consider sending your golf clubs with Send My Bag. Make sure you find out how best to prepare your golf clubs for transit by visiting Send My Bag's information page on how to send golf clubs. Denmark is a fantastic cycling destination, with lots of dedicated cycle routes and generally flat terrain. Why not take in the Danish scenery on your bike by shipping your bicycle to Denmark with Send My Bag? Send your bike to your first hotel and have it picked up again at your final accommodation. Learn more about bike shipping with Send My Bag. If you are attracted by Denmark’s quality of living, and are moving there for good, you will need to look into international removals to Denmark in order to transport all of your possessions. Before you hand over anything to the movers, however, ensure that all your items are carefully packaged so that they won’t get damaged in transit. Use appropriate packaging for your items and secure everything well. Top universities in Denmark include the University of Copenhagen, the Technical University of Denmark and Aarhus University. If you are going to study in Denmark, you can send all your items with Send My Bag so that you can quickly and easily set up home in your student accommodation. Find out more about student shipping with Send My Bag and how to claim your student discount. You could send a parcel to Denmark with Send My Bag. Friends and family could use this option to send you a care package or to forward something that you have left behind. You should choose a good sturdy box when sending a parcel to Denmark and seal it up well so nothing gets damaged in transit. Also make sure you know about rules regarding brand new items (see below). Read more on our parcel shipping information page to find out what you are permitted to send with Send My Bag, and how to package your items. Air freight is one option for sending big bulky items, such as a writing desk or a chest of drawers, to Denmark. Sending items by air freight usually takes one to two days, which is normally faster than sea freight shipping, but generally more expensive. What you have to pay will depend on the weight and size of your shipment. You will probably also have to use the services of a customs agent to handle customs clearance. And, you need to work out how to get your items to and from the airport, which means that costs could quickly mount up. If you send internationally by air freight to Denmark your items will likely arrive at one of the major airports, such as Copenhagen, Aarhus or Esbjerg Airports. Instead of air freight, you could try sea freight or container shipping to move your possessions to Denmark. Again, this option is usually used when transporting large items, like a pool table or a wardrobe. Sea freight usually means shipping items in large containers loaded onto cargo ships. It can be cheaper than air freight, but you will still need to use the services of a customs agent and will need to sort out how to get your items to and from the ports, which means it could cost more than expected. When using container shipping to Denmark your items will most likely arrive by ship at one of the major sea ports, such as Copenhagen, Aarhus or Esbjerg. Based on 38853 independent reviews. Everything went well - good and easy tracking system. Will recommend and use the service again in the future. Packing list must state ‘Personal Effects’. Any Personal Effects shipments are expected to take an additional 48hrs to clear customs. Most countries allow a certain amount of personal effects to cross their borders without taxes or duty needing to be paid. Personal effects are usually considered to be used items that the sender has owned for at least 6 months. To show that your shipment is made up of personal effects, you need to complete a packing list, to be completed as follows: "6 x Cotton Blouse, 1 x Shorts, 3 x Denim Skirt", and so on, rather than as "10 x Used Clothing". If your shipment is stopped by Danish customs and found to contain brand new or commercial items, you may be required to pay taxes or duty before you can take receipt of your items. If you are sending Christmas gifts please check with Danish customs so you are aware of potential customs duties, follow advice given and attach all necessary documentation. Customs processes and allowances do vary by country and as such we advise all travelers take 5 minutes to check how their personal circumstances and what they are sending will be assessed under prevailing Danish customs regulations. Danish customs allow duty free entry for gifts with a maximum value of 360 DKK (€44). If the shipments value exceeds 360 DKK (€44) duty & tax will be applicable to the entire shipment. The Danish definition of a gift is a shipment that happens ‘occasionally’, includes only goods that are intended for the recipient or their family’s personal use and the shipment is sent without exchange of money between the shipper and receiver. With Send My Bag™ you can travel with almost everything you would normally find in a vacation suitcase. For security and customs reasons, however, certain items are prohibited. Please find these listed below. Electrical Items, including but not limited to; Tablets, Cell Phones, Computers, Hi-Fis, TVs. You can visit some wonderful and fascinating cities and towns in Denmark. Copenhagen – Denmark’s capital city ‒ offers something for everyone, from cultural and historical experiences to luxury shopping and a vibrant night life. Then you have Aalborg. A historical city with a picturesque centre, Aalborg hosts the biggest carnival in Northern Europe and is also famous for its nightlife. Ribe is Denmark’s oldest town and is home to some of the best preserved medieval buildings in the world. And Billund, situated in Jutland, is the birthplace of the world’s best loved toy, LEGO. Legoland is Denmark’s most visited tourist attraction outside of Copenhagen and is great for families. The official language of Denmark is Danish, although English is widely spoken as a second language (close to 90% of Denmark’s population speak English). Many Danes also speak German due to its proximity to the country. It’s also part of the EU, but uses the Danish krone rather than the Euro. With its large coastline, Denmark offers tourists ample opportunities for fishing, both on the coast and in freshwater. A permit is needed for costal fishing and for many freshwater spots, although some do offer you the chance to fish for a small fee. Another activity popular with tourists is hiking. There are many trails throughout the country, most of which are interconnected and encompass a range of accommodation and attractions along the trail. Because of its fair weather, Denmark makes a great destination for activity vacations or relaxing breaks away.